We are a Regina based Community Band. Bob Mossing identified a need for a community based marching band in the Regina area so in 2005 he formed the Mossing School of Music to meet that need. The mossing band has thrived as a family oriented organization allowing the opportunity for parents and children to participate in music together. The fun and relaxed atmosphere helps young musicians to develop a solid foundation in music before joining a school band program. For those in a school band program, it challenges them to push their abilities and become better musicians. For many it provides an opportunity to learn to play a second instrument. 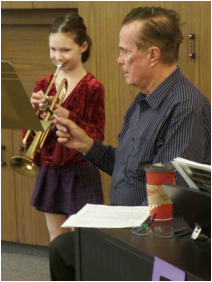 A well recognized and respected Saskatchewan figure, Bob has dedicated his life to nurturing the musical talent of over 10,000 students in his career as a Band Director. For his outstanding contributions as a music educator and leader, Bob received the Order of Canada in 1995. Many of his former students now participate in a number of musical groups for band alumni, and a significant number have gone on to careers in music education or entertainment fields., The winning tradition has continued with the Mossing School of Music’s concert and marching bands.